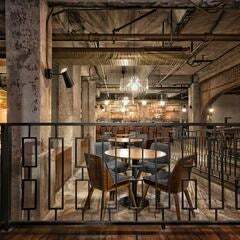 Your home base for this Car Free itinerary is the Ace Hotel Downtown Los Angeles, located in the historic Broadway District. Opened in January 2014, the Ace Hotel features 180 rooms, the LA Chapter restaurant, and a rooftop bar and pool with spectacular panoramic views of the city. The hotel was originally built as the United Artists Building in 1927. 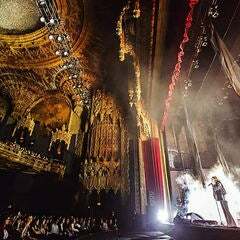 The adjacent 1,600-seat Theatre at Ace Hotel was restored to its former glory and celebrated its grand opening in February 2014 with a concert by Spiritualized. The hotel’s eclectic design features custom furniture, vinyl turntables in every room, and nods to 1920s flappers, ’70s punks, gangsters, Hollywood glamour, Frank Lloyd Wright, Spanish Colonial and Mid-Century Modernism. From the Ace, walk northeast on Broadway and admire the historic theatres of the Broadway Theatre District. Stretching for six blocks from 3rd to 9th Streets, the Broadway Theatre District includes 12 movie theatres built between 1910 and 1931. The Broadway Theatre District was added to the National Register of Historic Places in May 1979, the first and largest historic theatre district listed on the Register. 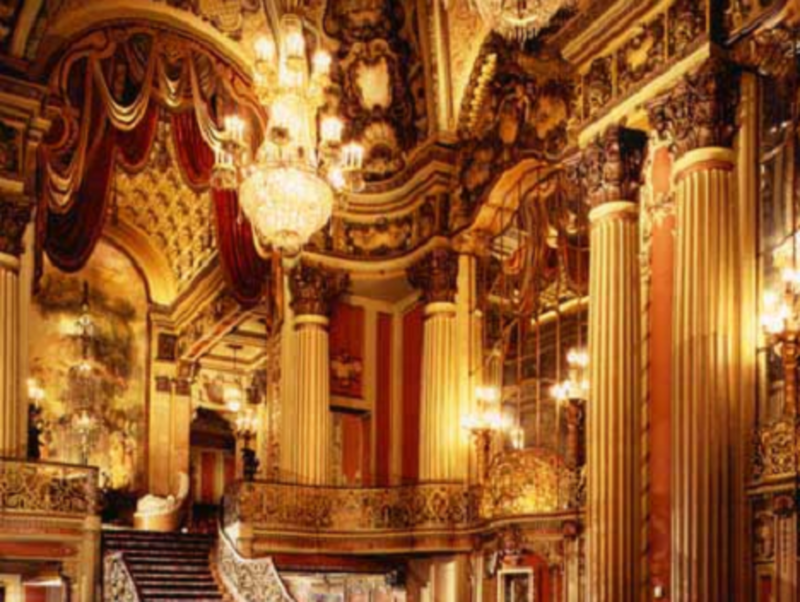 It is the only large concentration of movie palaces left in the United States. 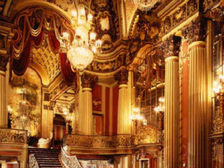 Designed by architect S. Charles Lee, the Los Angeles Theatre was the last and most extravagant of the ornate movie palaces built on Broadway between 1911 and 1931. The 2,000-seat movie palace features an opulent French Baroque interior that was reportedly modeled after the Hall of Mirrors in Versailles. The main lobby features a 50-foot ceiling, chandeliers and a grand staircase. Together, the main lobby and basement lounges could accommodate 2,000 people waiting for the next showing. Continue past the Los Angeles Theatre, turn right at 6th Street then left on Main to the Nickel Diner. 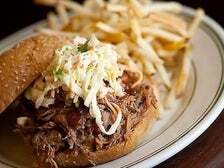 Opened by Kristen Trattner and Chef Monica May in 2008, the popular dining spot features hand-painted menus that the owners uncovered during construction, plus red booths and a semi-open kitchen that serves up hearty comfort food. 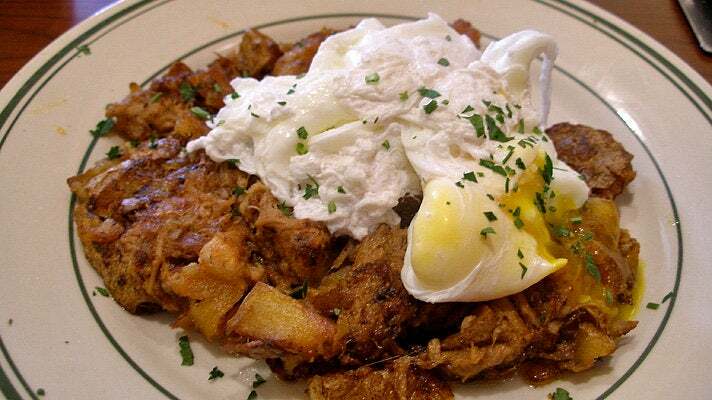 The 5th and Main, named for the diner’s address, features spicy BBQ pork hash topped with a pair of poached eggs. Save room for the signature maple bacon donut, which Sharlena Fong created before opening nearby Semi Sweet. 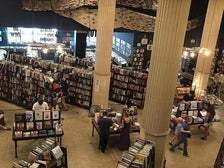 After breakfast, walk northeast on Main and turn left at 5th Street to The Last Bookstore, which sells more than 250,000 new and used books and magazines. 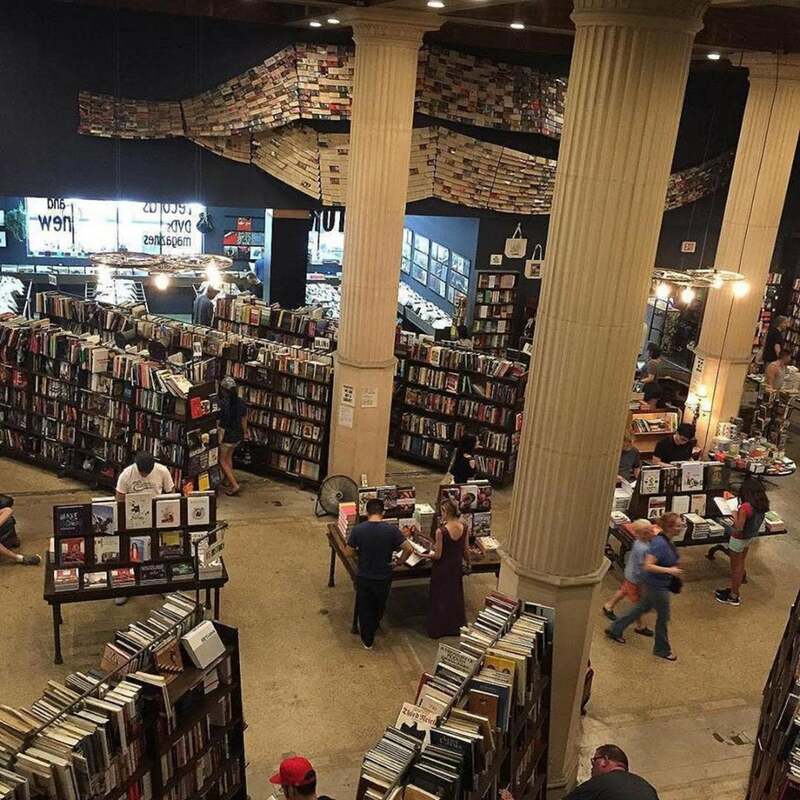 In addition to its vast selection of titles across all genres, the store itself is a must-see for its interior design alone. Not only are there books for sale, but printed material is adapted to create a unique environment where novels, anthologies, manuals and storybooks actually become a part of the store's own layout, too. Don’t miss the mezzanine level, which includes the Labyrinth Above The Last Bookstore (the back room sells 100,000 books for $1 each! ), Gather Yarn Shop and the Spring Arts Collective gallery shops. Exit The Last Bookstore, walk up 5th Street and turn right on Broadway to the landmark Bradbury Building. Located on Broadway across from the historic Grand Central Market, the Bradbury Building has appeared in movies, TV episodes and music videos, and is frequently mentioned in literature. Built in 1893, the building was featured prominently in the 1982 sci-fi classic Blade Runner, while film noir fans will recognize it from films such as Chinatown (1974), D.O.A. (1950), and I, The Jury (1953). Visitors are allowed up to the first landing, but not beyond it. Be sure to take a selfie with the Charlie Chaplin statue that’s located near the lobby. Cross Broadway and explore the landmark Grand Central Market, celebrating its 100th anniversary in 2017. Renowned as one of America’s great food halls, GCM opened in 1917 and has experienced a major renaissance in the past few years with a new generation of vendors opening alongside institutions like China Cafe, Roast To Go and Tacos Tumbras A Tomas. One of the market’s most popular spots is Alvin Cailan’s Eggslut, featuring indulgent breakfast sandwiches that come on either buttery brioche buns or flaky biscuits. G&B Coffee is one of the nation’s most progressive coffee peddlers, with a multi-roaster coffee lineup and creative signature beverages. 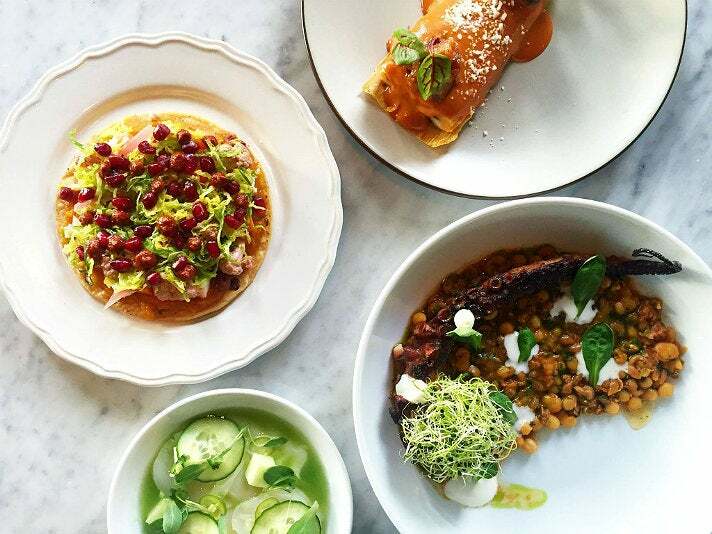 At Madcapra, Sara Kramer and Sarah Hymanson bring a breath of Brooklyn air to GCM with square falafel, house-made flatbread and color-coded accompaniments. Christophe Happillon, aka The Oyster Gourmet shucks some of North America’s most pristine shellfish with a commitment to merroir (oceanic terroir). Head downstairs for a waffle cone stacked with scoops of McConnell’s Fine Ice Creams in flavors like sweet cream and salted caramel chip. 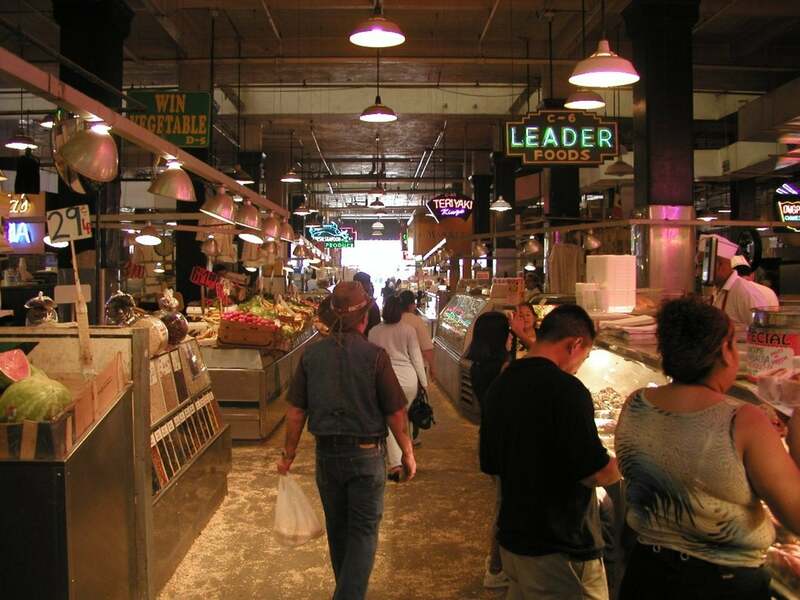 For more info about Grand Central Market, read our detailed guide. From the Grand Central Market, walk northeast on Broadway, turn right on 1st Street and left on Spring to Los Angeles City Hall. Completed in 1928, City Hall is the center of the government of the City of Los Angeles and houses the mayor's office and the meeting chambers and offices of the Los Angeles City Council. Free tours of the central rotunda, the press room and council chambers are available. City Hall has an observation deck that's free and open to the public Monday through Friday during business hours. The Lindbergh Beacon, located at the peak of the pyramid atop City Hall, is an airplane beacon named in honor of legendary aviator Charles Lindbergh. The beacon is occasionally turned on for special occasions, such as New Year's Eve. 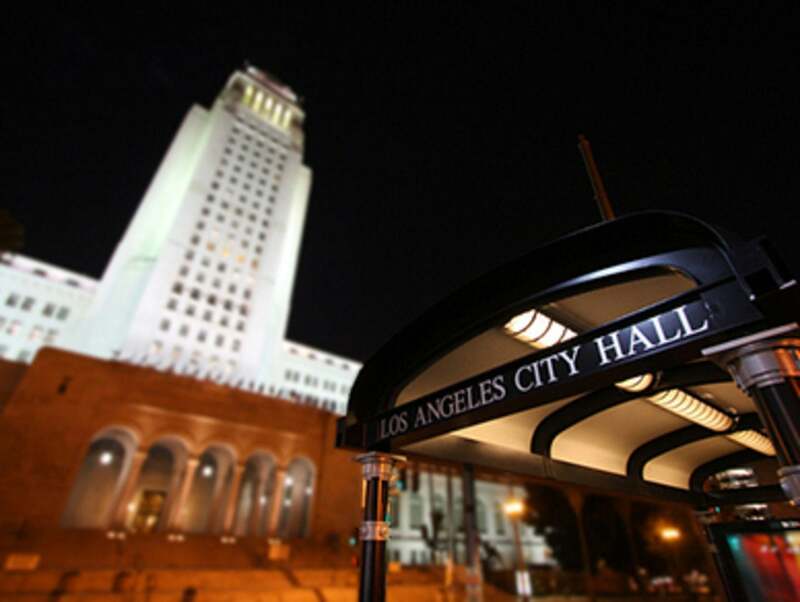 City Hall has appeared in numerous movies and TV series, including War of the Worlds (1953), L.A. Confidential (1997), Gangster Squad (2013), Dragnet, Perry Mason and Adventures of Superman (as the Daily Planet building). 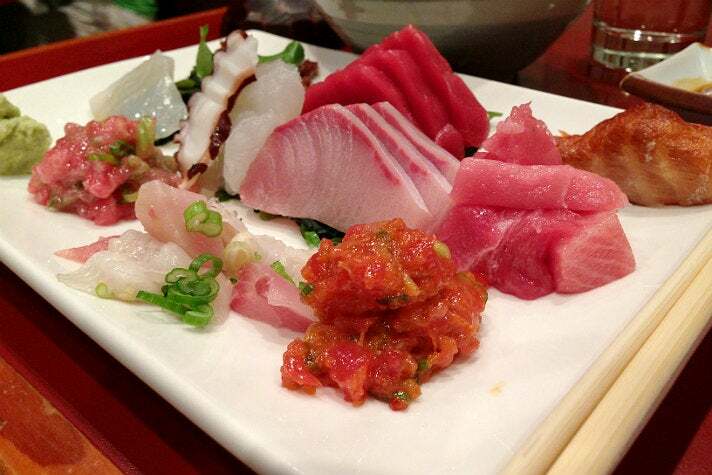 To enjoy one of the best sushi deals in L.A., walk southeast on 1st Street. Turn right on Central and left on 2nd Street to Sushi Gen, located in the Honda Plaza strip mall. Just before 11 a.m. every day, eager diners queue up for the famed sashimi lunch special, which is priced at just $15. The special comes with miso soup, a warm tofu dish, a big bowl of rice, and a large sashimi plate. 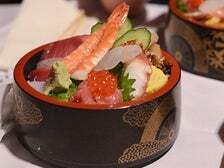 Fish selection varies, but usually includes tuna, yellowtail, spicy tuna or toro, octopus, a mountain of kelp, and cooked fish. Note that the lunch special is only available at a table, not at the sushi bar. After lunch, walk up 2nd Street and turn right on Central. Cross 1st Street to the Japanese American National Museum (JANM). 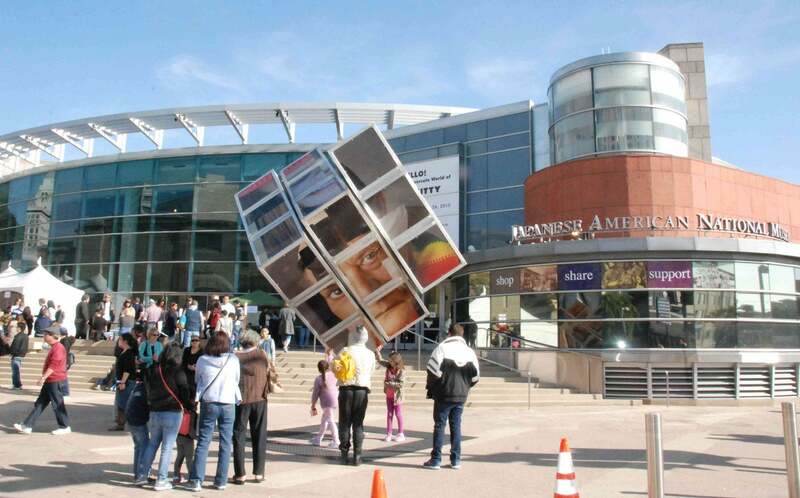 The museum is internationally recognized for its commitment to exploring America’s ethnic and cultural diversity by presenting and sharing the experience of Japanese Americans with exhibitions, public programs, an award-winning museum store and resource center. The ongoing exhibit, Common Ground: The Heart of Community features hundreds of objects, documents and photographs that chronicle 130 years of Japanese American history, beginning with the early days of the Issei pioneers, through the World War II incarceration to the present. Located adjacent to Little Tokyo, the revitalized Arts District is one of the most exciting neighborhoods in L.A., with new lofts, galleries, restaurants and shops opening at an incredible pace. 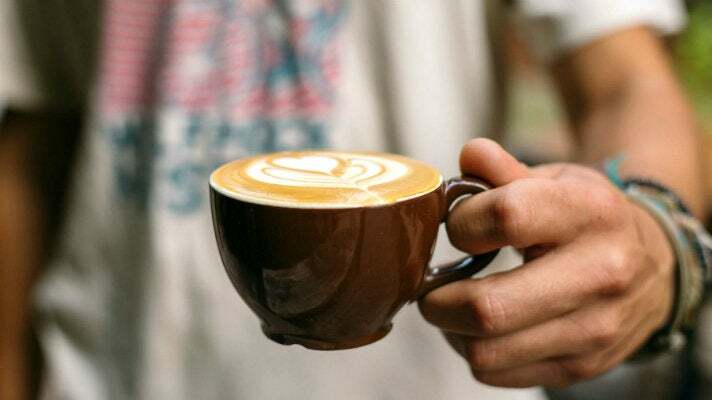 The Arts District is affectionately known as the “Coffee District,” home to some of the top third wave coffee purveyors in the city. 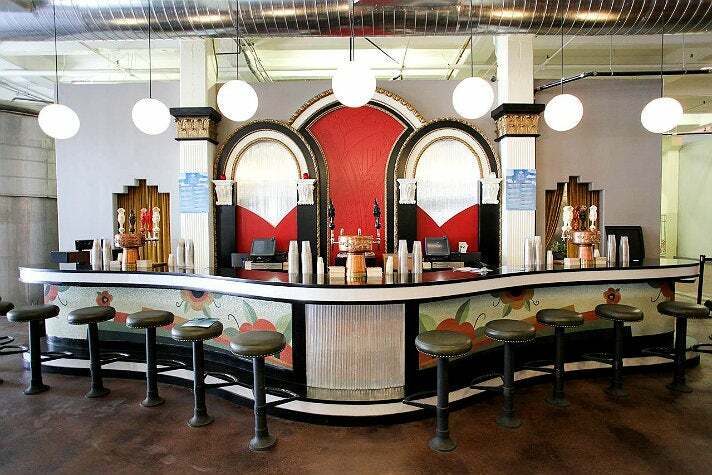 Read on for the best places in the Arts District to get your caffeine fix and more. The Arts District is also well-known as an L.A. craft beer hub, along with Torrance and Redondo Beach in the South Bay. 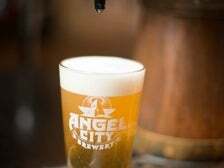 The Downtown L.A. craft beer boom isn’t limited to the Arts District - Little Tokyo is home to Boomtown Brewery and Mumford Brewery, while Dry River Brewing and Indie Brewing Company are crafting beer in nearby Boyle Heights on the other side of the L.A. River. 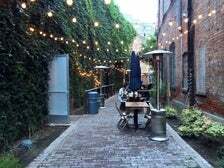 Read on for an optional beer crawl in the Arts District. From JANM, walk northwest on 1st Street. 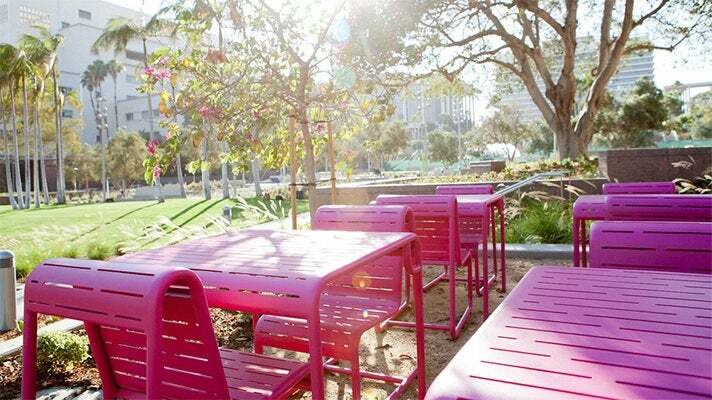 Turn right on Spring to Grand Park, an urban oasis that stretches from Spring Street at City Hall to Grand Avenue at the Music Center. Throughout Grand Park, open spaces are available not only for casual sitting and leisurely strolling, but also for civic gatherings. The 12-acre park has four distinct areas, featuring the restored Arthur J. Will Memorial Fountain, an intimate performance lawn, a community terrace, and a grand event lawn. 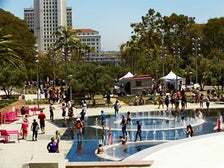 Since its opening in 2012, Grand Park has become a popular gathering spot for community events, cultural experiences, festivals and holiday celebrations. Visitors can bring their own picnic or purchase food and beverages on site. Certain events will invite food trucks and other food vendors. The park is open to the public every day from 5:30 a.m. to 10 p.m.
From the top of Grand Park, walk southwest on Grand Avenue to Walt Disney Concert Hall. 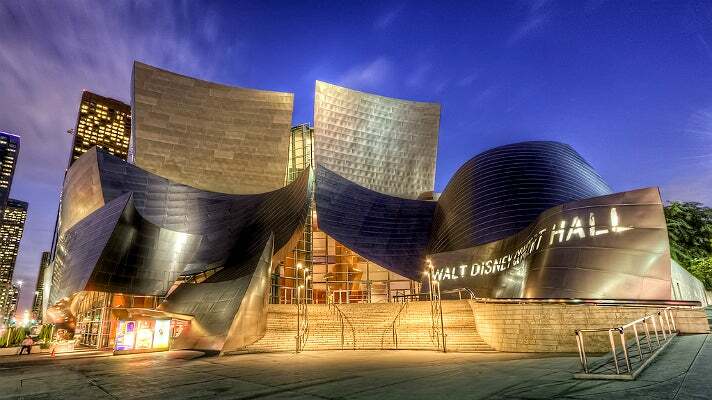 Designed by Pritzker Prize-winning architect Frank Gehry, with acoustics by Yasuhisa Toyota, Walt Disney Concert Hall has received worldwide critical acclaim and praise from concertgoers for its stunning architecture and extraordinary sound. 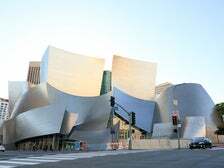 The concert hall seats more than 2,200 people and is home to the Los Angeles Philharmonic and the Los Angeles Master Chorale. 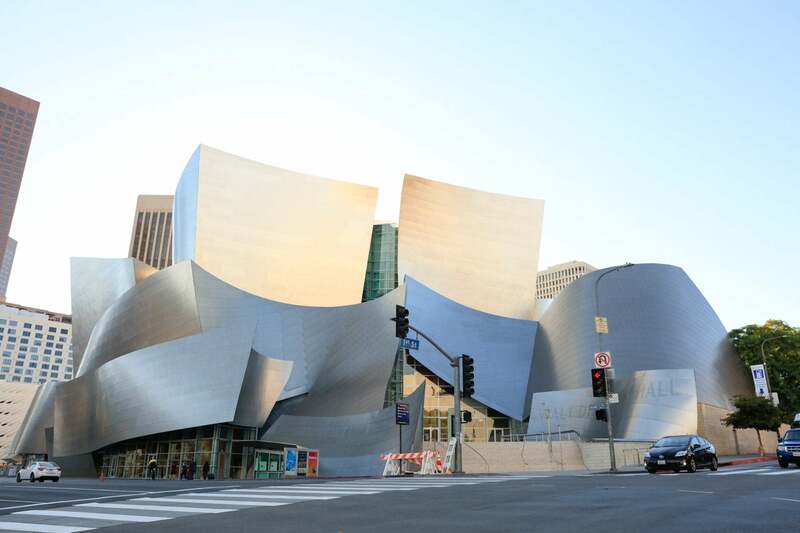 Visitors can explore Walt Disney Concert Hall on a self-guided audio tour or a guided tour. Audio tours are the most comprehensive way to explore the hall and are offered most days. The self-guided audio tour takes visitors through the concert hall’s history, from conception to completion. Docents take visitors on guided tours through much of the interior space and throughout the gardens while presenting the highlights of the spectacular building. Read our guide to the hall's must sees and hidden gems. 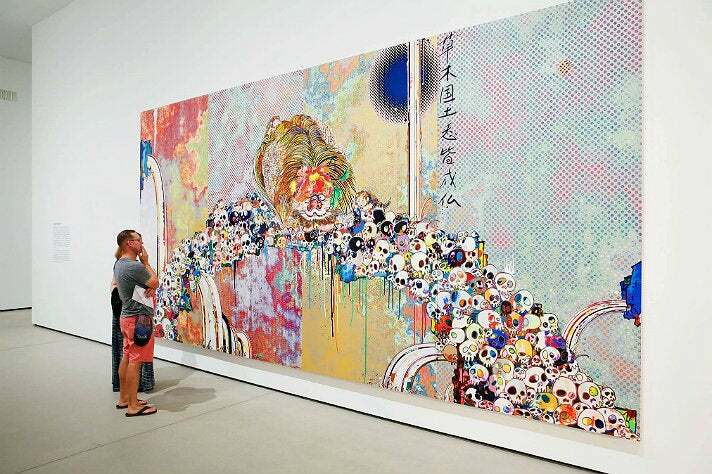 Founded by philanthropists Eli and Edythe Broad, The Broad is a new contemporary art museum that opened in September 2015. 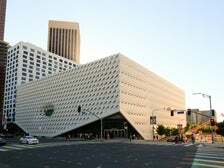 The 120,000-square-foot, $140-million building features two floors of gallery space to showcase The Broad’s comprehensive collection and is the headquarters of The Broad Art Foundation’s worldwide lending library. Advance ticket reservations can be made online and have consistently been booked within hours of release. Same-day tickets are always available at the museum every day except Mondays, when the museum is closed. Wait times in the onsite standby line range from 10 to 45 minutes on weekdays and 60 to 90 minutes on weekends. The standby line wait during holiday peak times has stretched beyond three hours. Walk southwest on Grand, turn right on 5th Street and enter the iconic U.S. Bank Tower. Located nearly 1,000 feet above the city, OUE Skyspace LA opened at the U.S. Bank Tower in June 2016. California’s tallest open-air observation deck is a must-see destination for tis unforgettable 360-degree views of Los Angeles. 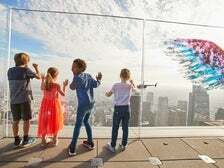 The highlight of OUE Skyspace LA is the Skyslide, a first-of-its-kind outdoor glass slide that’s attached to the exterior of the U.S. Bank Tower. 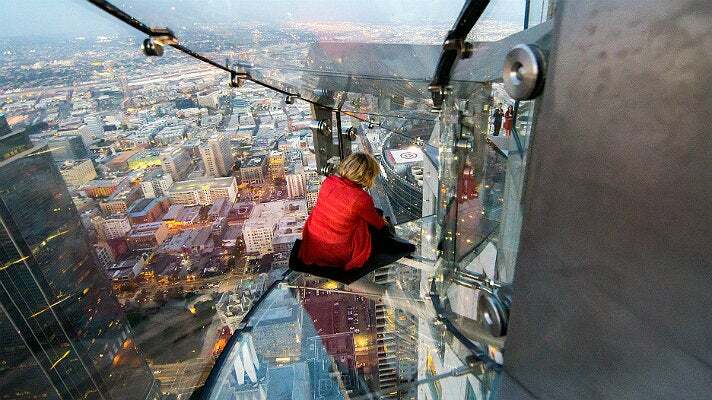 The Skyslide is 45 feet long, about four feet wide and made entirely with 1.25-inch glass. Visitors will glide from the 70th to the 69th floor of the U.S. Bank Tower and see Los Angeles in a way that few will ever experience. Daily admission to OUE Skyspace LA is $25 and Skyslide passes are available for $8, with group admission also available. Each of these passes are sold at timed intervals. For more information, visit www.skyspace-la.com/tickets. After the adrenaline rush of Skyspace, you’re going to need a cocktail to calm your nerves. Exit the U.S. Bank Tower, turn right on 5th Street and turn left on Flower to The Standard Downtown L.A. Few hotel pools are as iconic as the one at The Standard, which is likely why Travel + Leisure voted it one of the top 10 hotel swimming pools in the world. Situated on the rooftop, the outdoor pool features funked out vibrating waterbeds and a cocktail lounge. Extras like movie nights and DJs take “pool party” to the next level. 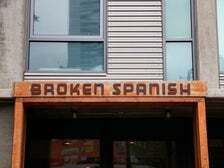 After cocktails, walk a half-mile southwest on Flower to Broken Spanish, Chef Ray Garcia’s take on contemporary Mexican cuisine. Start with the exceptional heirloom corn tortillas, which can be ordered with refried lentils or whipped carnitas fat. Mains include the comforting rabbit mixiote, a stew with nopales, bacon and cherry tomatoes that’s served in a cellophane bag. Be sure to save room for desserts like the arroz con leche with arborio rice, roasted pear, blackberry jam, warm tres leches and canela. After dinner, you can stop by Honeycut, one of L.A.'s top hidden bars. From the new entrance off Flower, you can decide which of the two rooms you're in the mood for. On the cocktail side, you can lounge or saddle up to the bar with selections from their drink, punch, wine and beer menus. Launched in March 2016, The Deep End takes over the cocktail lounge on Sunday, Tuesday and Wednesday. The Deep End transforms the room into a blacklight, Space Age Tiki bar with tropical/sci-fi libations to match. 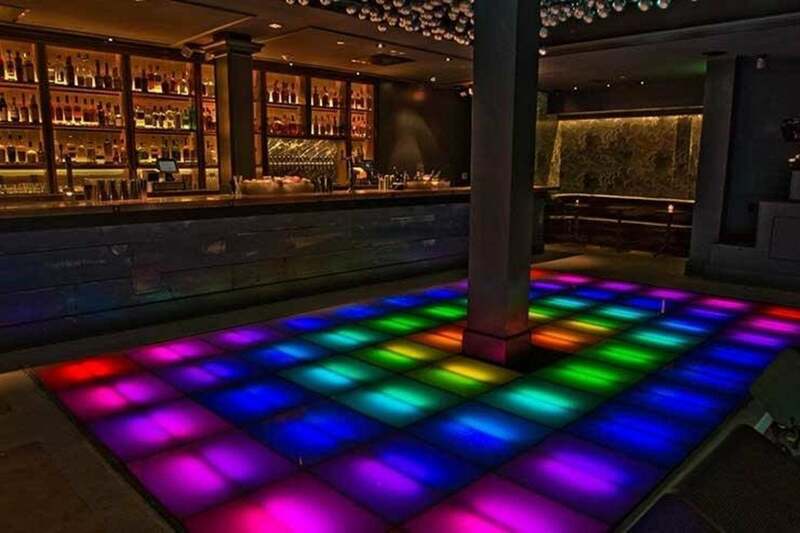 On the other side, get down with a DJ and a lighted disco dance floor. 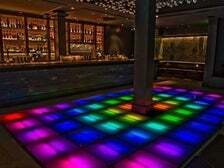 Shooters and cocktails on tap would be the main events here, if it weren't for your awesome moves. 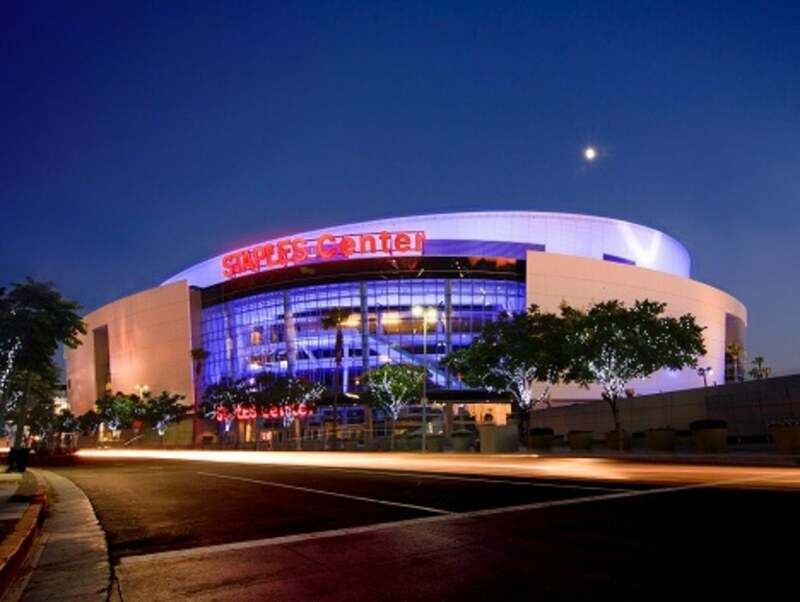 For those seeking an experience on a much larger scale, it’s a short walk from Broken Spanish to STAPLES Center, a world-class sports and entertainment venue located at the spectacular L.A. LIVE complex. 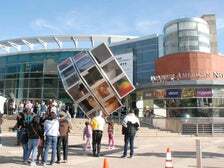 From 9th Street, turn left and walk southwest on Figueroa to Chick Hearn Court. 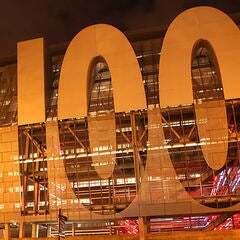 STAPLES Center is the home of four professional sports franchises: the NBA’s Los Angeles Lakers and Los Angeles Clippers, the NHL’s Los Angeles Kings, and the WNBA’s Los Angeles Sparks. STAPLES Center hosts over 250 events and more than 4 million guests annually, with events ranging from live music and family shows to professional sports and the annual BET Experience.